A marquee can make the perfect venue for a corporate event as a marquee provides a versatile space and blank canvas in which to host your event. 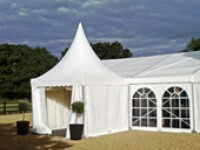 Grice Foster provides professional corporate event marquee hire in Norfolk and Suffolk. With a simple and professional look, our marquees are ideally suited to networking events, conferences and business fairs. If you will be catering for your guests during your event we also provide banquetting and furniture hire services. Break free of the hotel conference room to make your event stand out amongst the crowd. A marquee can provide a distinct and memorable venue for your event. Almost everything about a marquee is customisable, so you can truly make your event a unique one your guests will remember. Often the success of an event can depend on its location. One of the reasons a marquee is a fantastic choice for your next event is that they can be put up (almost) anywhere. They just need a flat surface and enough space. This means you can choose to host the event close to where your guests work. You could even choose to take advantage of the stunning scenery of the Broads National Park. Inviting your guests to a location to see nature and wildlife you won't find in a conference room. Why choose us for your corporate event marquee hire? At Grice Foster we only hire quality marquees, we have a vast range of sizes to suit any venue or occasion, and our prices will always be competitive. Our experienced team can help ensure your event runs as smoothly as possible. We know there isn't a second chance to get it right. We offer a free site visit, friendly helpful advice and a no obligation quotation. We also listen to your requirements first hand and discuss how we can help contribute towards making your corporate event achieve its objectives. So if you're looking for corporate event marquee hire in Norfolk, contact us by clicking the button below for your free no-obligation quotation.